Hi, all F#er!! My name is Kouji Matsui, I live in Japan and I’m architect/developer. F# Compiler Service is likely “Roslyn” under C#. That’s parsing for F# source code and output AST (Abstract syntax tree). Then can compile and output to executable binary from ASTs. Another usage, F# Compiler Service have capability of interactive interpreter for F# (backend for fsi). I try to write this project’s background: Why do I develop alternate compiler for F#? This auto translate library called “Filter library” and I want to can be extendable and expandable for non limitation – For example, a filter library can handles for insert another code fragments to before/after method body (by uses AST translate. likely AOP) Sure this is example, we can handle ANYTHING by AST translations. For fscx users, fscx uses not directly. 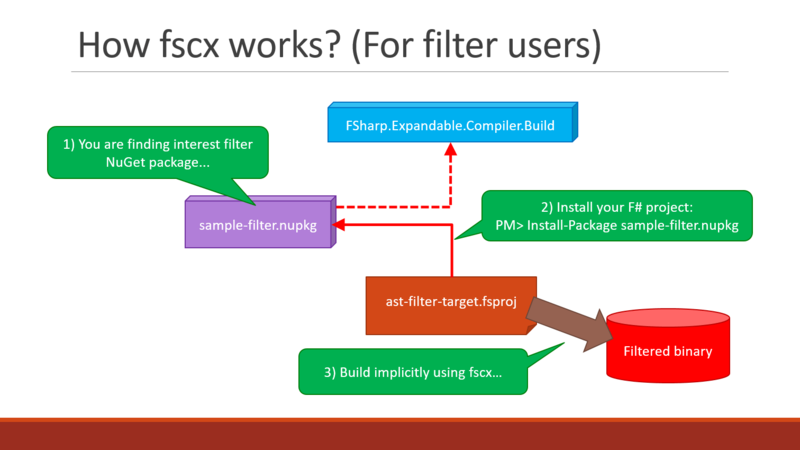 We are implicitly using for fscx depended from the “Filter library” via NuGet. We can select filter library from the purpose. If installed fscx then auto replace the F# compiler (fsc.exe) to fscx. 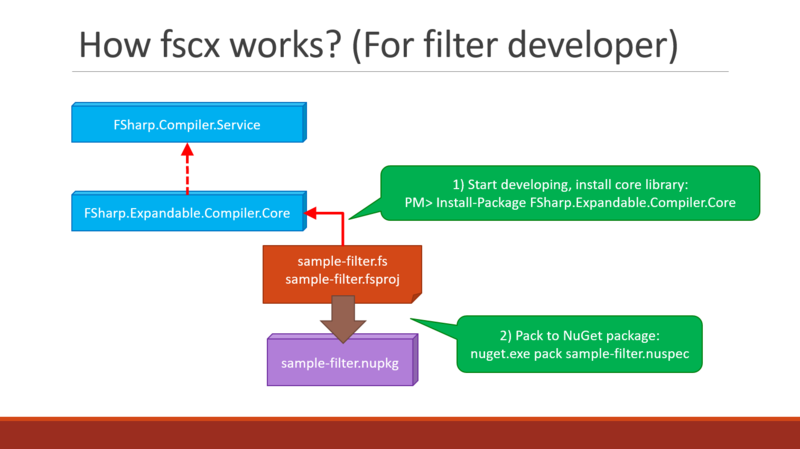 For example, this slide identicate the box “sample-filter.nupkg.” This is packaged filter library on NuGet. We download and install this package via NuGet. NuGet client auto install depended packages include fscx named “FSharp.Expandable.Compiler.Build.” And ready for auto translate ASTs by filter library and fscx. Then compile and output translated binary. This translation executes at compile time. Sure no text-based translation. Then we can effect this translation for only installing filter library via NuGet. Very important at this point: Users don’t know about filter implementation details. I’m designing for fscx to do in transparents. More complex for filter library side. Filter library must use F# Compiler Service’s AST types, so library has assembly reference to F# Compiler Service and the fscx core library too. fscx core library package is naming for “FSharp.Expandable.Compiler.Core.” This package install to filter library project via NuGet. F# Compiler Service not provides standard visitor pattern infrastructures – Because we can implement visitor pattern with both the functional programming (FP) technics and pattern matching. But code fragments must has frequently recursive calls. So I developed visitor pattern helper functions on FP-based contains recursive callers. Which choice of better technics? There is both merits and demerits which is desirable. If you use OOP based, you can receive all AST nodes at visit timing but more complex and difficult for how to identicates structurable-nested AST nodes. If you use FP based, can easier structurable-nested AST nodes (by pattern matching) but you can receive only “SynExpr” nodes at visit timing. These helpers are totally not depended on fscx. I separate visiter pattern helpers from fscx and construct standalone package for “FSharp.Compiler.Service.Visitors.” If you are thinking about how to apply visitor pattern for your application, try to use this package. # This package fixed for the most part in version 0.7.1. # Maybe not change for public declarations. What difficults for AST translations? # If you want more informations about Expression-tree, read these posts: Second half of Advent LINQ 2013 (In Japanese) and/or “Final LINQ Extensions III” (In Japanese). We are trying to implement the “sample-filter” above: We need knowns about what realize AST structures and where AST nodes appearance for? And how to translate AST nodes? The “Tupled arguments” method different for “Curryable arguments” function. We are finding for differents in AST nodes. Tupled arguments realize for SynExpr.Tuple AST node. But curryable arguments realize for nested SynExpr.App AST nodes. Ast.SynExpr.App( (* funcExpr *)     // App - Apply "ABC"
It’s contains too many verbose fragments so ugly (sorry). That means output1’s arguments declarates by list, output2’s arguments declarates by nested “SynExpr.App” (Apply argument). Will we have what intercept anything (by fscx)? This library is “Middleware” for fscx, we can safe implements for insert custom code between enter and leave function points. Today, we are calling the “AOP (Aspect oriented paradigm)” for this technics. If we use this helper library by develop filter library in this case, our filter code are simple, safe and more easier. methods are calling from after function called. “Enter(…)” method received the method name, source code file name, line/column number and will be calling with arguments. This sample codes prints these information to Console and create instance for “SampleAspectContext” class and return. “Leave(…)” or “Caught(…)” handles to print leave messages. “Leave(…)” can receive for function called result. “Caught(…)” can receive for exception instance. // This is declaring for aspect: "SampleAspect" class. // Class name is free. Totally aspect tips: Aspect codes and this declaration requests loose types, so we can write aspects by C#. And fscx insert custom AST nodes after called function. Call to “SampleAspectContext.Leave(…)” or “Caught(…).” Leave with called function result value, Caught with exception instance by (inserted) try-with block. This sample code declare “f11(…)” by tupled arguments method, sure can translate for function by curryable arguments. Currently, I’m developing “FSharp.Expandable.Compiler.Aspect” now and not finish, because how to set where insert aspects to the target function. fscx is easy-usage (by install NuGet) for any filter users. We can develop any auto translation by ASTs (but very difficult). We can develop easier any AOP based senarios by using fscx’s middleware. 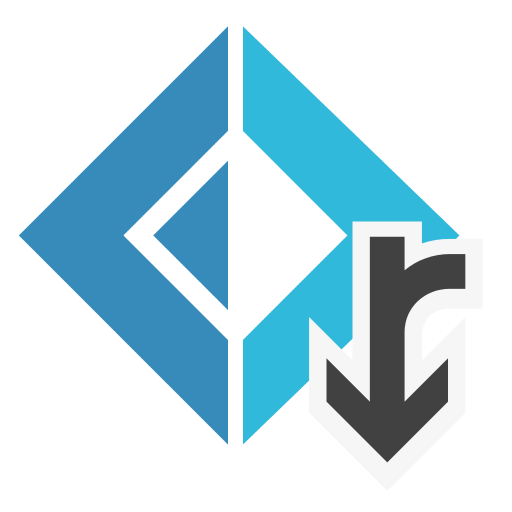 All filter libraries can deploy by NuGet packaged. We often write for UI codes, for example how to implement “INotifyPropertyChanged.” fscx is capable for can filtering auto-implement this interface, these senarios capsule to the middleware and running this code by no runtime cost. Finally we can construct ecosystem for filter libraries. Acknowledgments: Thanks cooperation for On the road corporation and Mr. bleis. Thank you for reading, welcome any comments! Happy christmas! !